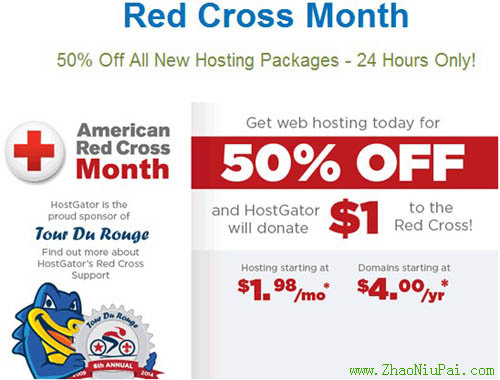 Hostgator鳄鱼主机5折优惠促销原文：Starting at midnight tonight, Tuesday March 25th, our American Red Cross promotion will be live! Snappy will be offering 50% off all New Hosting packages as well as domains for only $4. As a token of our appreciation for the Red Cross' efforts, we will be donating $1 for every new customer sign up during our 24 hour promotion! 2014年3月26日更新：刚收到邮件，Hostgator鳄鱼主机5折优惠促销活动增加一天，到3月27日下午13:00才结束，以下是官方消息原文：As a way to further support the American Red Cross, we have decided to extend the sale another 24 hours! The promotion will now end on Wednesday, 3/26 at 11:59pm CST. All other sale details will stay the same and feature 50% off all New Hosting packages, Domains for $4, plus the $1 donation to the Red Cross for each new hosting sign up.